Beyond the beauty and durability of stone is the intriguing story of each stone’s origin. 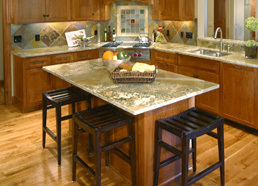 Stone Countertop Outlet’s granite, marble, limestone, onyx and other natural stone comes from all corners of the world. India, South America, Canada, China, Europe and from quarries throughout the United States, each stone has a history, a distinctive story to tell and very well may have traveled many thousands of miles. 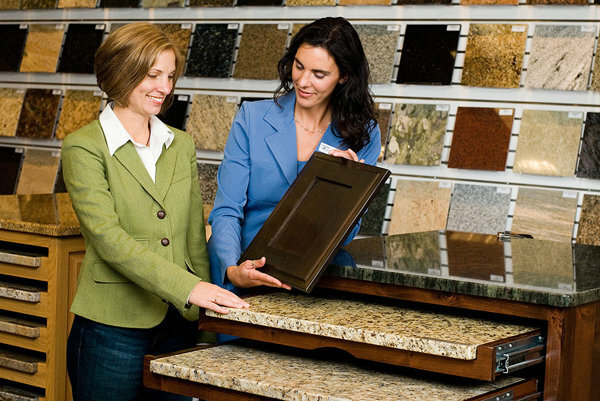 Selecting the stone color for your new countertops is the process people generally enjoy most. 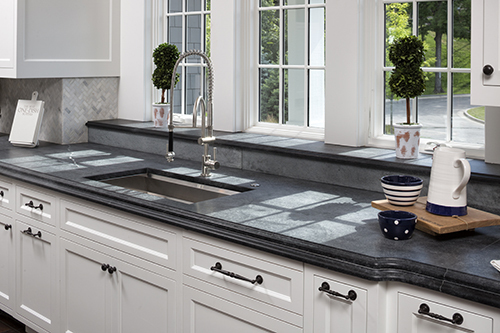 Stone Countertop Outlet offers thousands of slabs and hundreds of color including a full range of quartz surfaces and sustainable products. Because of the consistent color and pattern of quartz surfaces, you won’t necessarily need to select your exact slab. We would encourage that you view a sample prior to ordering your color to ensure it is exactly the color and pattern you want. Quartz surfaces are engineered (man-made) and are composed of 93% quartz. It offers the beauty and durability that stone lovers desire. 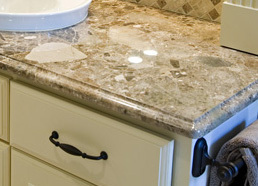 Stone Countertop Outlet offers a variety of edging options to add that finishing touch to your countertops. The edge detail represents the finished edge which faces outward and is highly visible. The edging process is a finishing process that takes the “sharpness” and minor imperfections out of the stone’s front edge and polishes it to an extremely smooth and uniform surface. From the standard 3/16″ Round option to the more elegant Full Bullnose or Ogee, you can be assured that great care and craftsmanship goes into every edging project we perform. Stone Countertop Outlet offers several options to select from for your countertop radius corners. Radius corners refer to the degree of “roundness” the countertop corners will have “Soft” corners are the corners that are exposed to traffic areas or where people walk. With a standard 1 1/2” overhang a maximum 1” corner radius can be used. The illustration below indicates that a 90 degree corner radius is generally used for countertop edges that abut to a wall or backsplash. Stone Countertop Outlet standard corner radius is 1/4″. This takes away the “sharpness” of the corner. 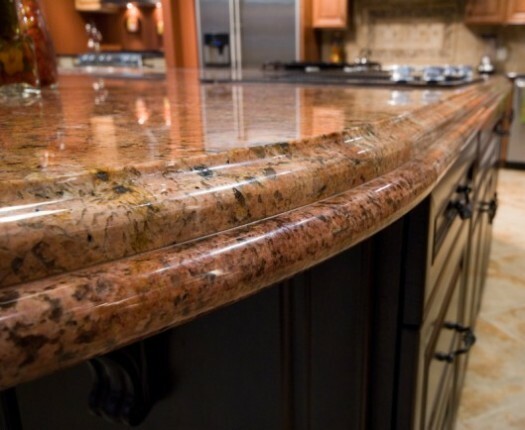 It is recommended that countertop customers select the 1/4″, 1/2″ or 1″ corner radius for edges that are exposed to frequent traffic from the people in your home. 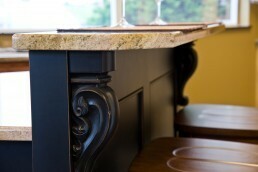 Stone Countertop Outlet is experienced at fabricating truly unique, one-of-a-kind countertops. Because everything we do is custom, your tops are fabricated specifically to fit your home. Depending on your cabinets and the space available, we can create a beautiful stone surface that allows you to maximize the available space. From single level counters with a gradually curved edge to tiered countertops that offer both a kitchen workspace and additional sitting areas, we can help you create counters that are functional and beautiful. For some great ideas and to see what other customers have done, we invite you to visit our Project Gallery. Including backsplash with your new countertops adds a finishing and elegant touch. it also provides protection against accidental spills. Stone Countertop Outlet’s standard backsplash is up to 3” high and 3/4” thick. Backsplash taller than 3” are considered custom. Standard backsplash that requires modification to fit around windows, outlets, etc. should be indicated on your countertop drawing. Please indicate any area that you would like custom backsplashes on your drawing. If you are unsure which type of backsplash best fits your needs, contact one of our Stone Specialists. Backsplashes that are taller than 3″ inches are considered custom. Please indicate any area that you would like custom backsplashes on your drawing. Also, include the dimensions of the custom backsplash area. When choosing natural or engineered stone countertops, keep in mind that a matching stone backsplash provides a beautiful and protective surface to the wall area where the countertops meet the back wall. A custom backsplash will provide an easy to care for surface and years of protection for wall areas directly behind cooktop surfaces that are exposed to heat, steam, food splatters and grease. 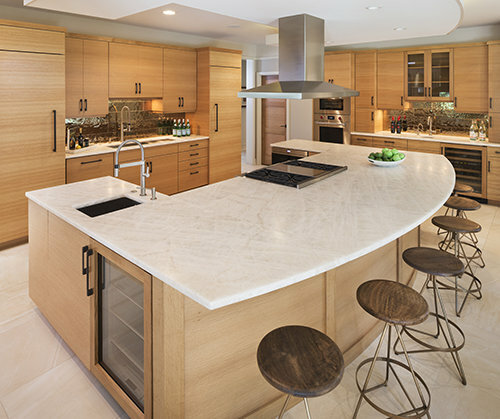 When choosing a stone surface for your countertops, you will need to determine how much of an overhang you desire. 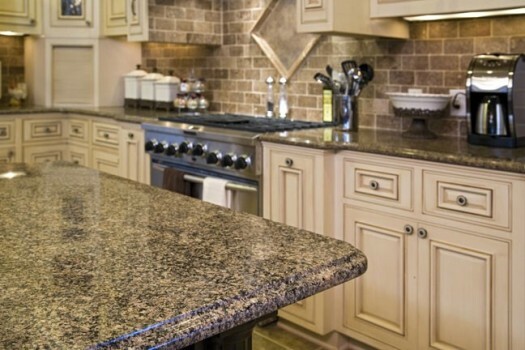 Granite-Tops’ standard overhang is approximately 1 1/2″. This provides a slight “lip” that extends beyond the front of your cabinets. If you have the space, and would like to create additional countertop space, you can extend your overhang. 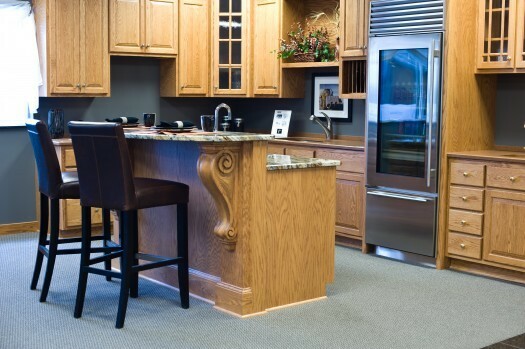 By adding another 8-12″ to your overhang (provided you have adequate room), you can add valuable countertop space that can be used as additional work space or as a snack bar area. It is important to keep in mind that countertops with an overhang of 12” or greater may require additional support. Extended Overhang, with wooden corbels for support. Support systems are not provided with the countertops. See one of our Stone Specialists for more information on the support needed for your project. The type of cooking surface you choose will directly affect the measurements of your stone countertops. A cooktop cooking surface is “dropped-in” to counter surface. Cooktop cooking surfaces requires that a precise cutout in the stone countertops be made during fabrication. A cooktop must be at the countertop installation location prior to final measurements being taken or a specific brand and model number must be provided. Your contractor or remodeler can provide you with specific cooktop requirements regarding the specifications needed. Ranges are often referred to as “free-standing” or “slide-in”. These do not require a countertop cut-out. 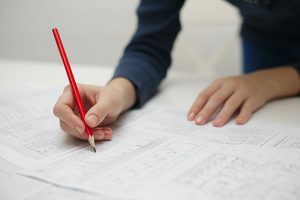 To ensure proper fit, a range must be at job site prior to final measurements being taken, or a specific brand and model number must be provided. Your contractor or remodeler can provide you with specific cooktop requirements regarding the specifications needed. If you choose a downdraft ventilation system that drops into your cabinetry or open space behind a cooking surface, an additional cut-out will be required for fabrication. This cut-out will allow your ventilation system to sit flush with your countertop. The downdraft vent should be at the job site for final measure to determine cut-out size and placement. This will also help to ensure it fits properly behind the cooking appliance. 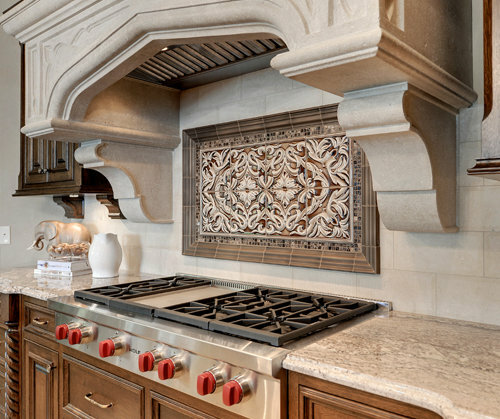 Your contractor or remodeler can provide you with specific cooktop requirements regarding the specifications needed. Stone Countertop Outlet has made the sink selection process easy. 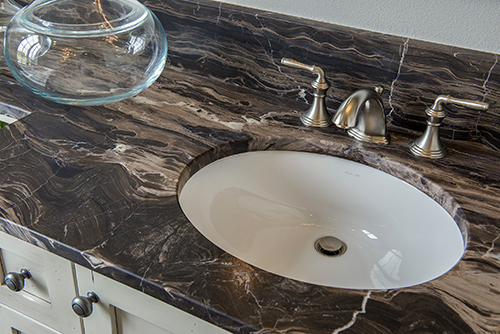 We offer many of the most popular sinks that are designed to work with stone countertops. Kitchen, bath, bar or laundry, we have a sink that will look great with your new countertops. When you choose to purchase your sink at Stone Countertop Outlet, you’ll save yourself time, eliminate hassles and gain peace of mind. You won’t need to shop around for a sink (unless you really want to). And you won’t have to worry about if the sink will match, or if the holes get drilled properly. Our sink selection process goes smoothly. Simply tell us which sink from our showroom display you want, or select one from our catalog and we’ll take care of the rest. We carry or have access to many of the most popular brands including Kohler, Eclipse, and Swanstone. If you choose to purchase your sink elsewhere, you’ll need to provide us with specific information about your sink model and style. This will help to ensure that accurate cuts are made for the sinks. It is necessary to select and purchase your sink early because each countertop is cut to fit a specific sink model. We can also help you with your faucet placement decision. Holes for faucets, sprayers, soap dispensers, water purification systems, etc. are cut during fabrication. It is important that we know the make and model before fabrication begins.